THE rich and the middle class are spending more on unhealthy food, according to the quick estimates of the national consumption expenditure 2007-08. The study measures the amount of money that consumers spend on food. This has led to increase in incidence of lifestyle-related diseases. The report was released by the Central Statistical Organization, Ministry of Statistics and Programme Implementation, on January 30. The report was compiled using data obtained from sales tax records in the country between 2000 and 2008. The results showed that expenditure on beverages, paan and intoxicants almost doubled from 1.6 per cent to 3.1 per cent. The money spent in restaurants increased from 1.9 to 2.6 per cent. Expenditure on healthy food like cereals and pulses reduced from 11.7 to 9.6 per cent and consumption of fruits and vegetables slumped from 9.5 to 7.7 per cent. "The repercussions of such unhealthy lifestyles are obesity, diabetes and heart diseases," said S K Wangnoo, senior consultant in Endocrinology at the Apollo Hospital, Delhi. He pointed out India, with over 45 million diabetics, is already the diabetes capital of the world. The expenditure estimates said money spent on healthcare rose from 4.7 per cent to 5.7 per cent. Sedentary lifestyle and easy access to unhealthy food items are some of the reasons cited for the rise in incidence of lifestyle related diseases. The World Bank has said that by 2015, coronary heart disease would become the leading cause of premature deaths in India. A study conducted on Delhi's school going children showed 18 per cent of the children were overweight. The study was carried out by Anoop Mishra from the Fortis Hospital in Delhi and published in the journal Nutrition in 2004. The study estimated that 15-20 per cent of urban schoolchildren in India are at risk of developing type-2 diabetes. 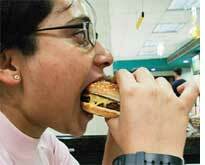 To curb this trend, the Union ministry of health intends to put a ban on junk food in schools and colleges. It also plans to improve labelling on food items to show their calorie content. These measures need to be strictly implemented, said Wangnoo.